Following their Northeast US Coast headlining mini-tour as well as their set at The Power Of The Riff in Los Angeles, Washington, DC-based DARKEST HOUR announces new tour through Canada for early 2019. 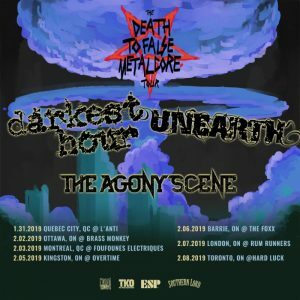 The Canadian leg of the Death To False Metalcore Tour will see the band performing across Eastern Canada from January 31st through February 8th, co-headlining with Unearth with support from The Agony Scene. The new dates precede the previously-announced European leg of Death To False Metalcore, which will see DARKEST HOUR and Unearth co-headlining with support from Misery Signals, Malevolence, and Left Behind, from March 21st through April 1st.